1. I wanted to learn how to knit in college. I remember the first time I became really interested was during my sophomore year in my Public Speaking class. Our assignment was an instructional speech. I decided to lecture about how to make my mother’s Arroz con Gandules. I did not bring any rice with me and I "pretended" to cook the food. My classmate, who’s name escapes me now, showed us how to knit a hat. And the hat she brought was a fair isle cap that I thought was amazing. I fell in Love. I didn’t learn until after I graduated and it’s possible had I did I wouldn’t have gotten my degree. 2. I like to start projects and feel it’s a chore to finish them. I’m someone who can go on spurts of excitment and then a big cool down. Hense the start of tons of projects and not many FOs. I get all frustrated because I think the satifaction of a finished project is so necessary! Currently I have rusted root, a bolero, a shawl, two socks and a scarf on the needles. 3. I am a yarn snob. I squish my nose at the idea of going to Michael’s or AC Moore to get yarn. I hate fuzzy fugly looking yarns. I love to get pretty yarns and rightfully so, if i’m going to spend a long time creating great knits, my yarn better be grand. I don’t mind knitting with mohair or fuzzy yarns but greatly prefer soft and smooth yarns. 4. I am a pattern snob, too. I love crisp, classic designs and I abhorr designs that have ugly looking color work or look too cheesily simple. I find that I like patterns from IK or Vogue. I will not pass judgement on other knit pattern magazines, but some of the patterns (w/fringe, etc.) are so awful they give knitting a bad name. 5. I have an ever growing stash that I hide in my closet so people who come by my apartment don’t yell at me for spending my money on yarn. I just can’t stop. 6. I usually buy yarn with a project in mind. Sometimes that project fizzles out and the yarn just hangs out waiting to be re-inspired by a different pattern. 7. I am a competitive knitter. I like learning new things and feeling that I know a little bit more than the next knitter. I also will challenge myself to be a better knitter. Like my egomaniac post yesterday – I also Love people who compliment my knitting. 8. I sometimes get stuck on a pattern or I’ll stop if something (even a little thing) goes out of wack. I won’t fix it right away and use the pause to start another pattern. Just like what’s happening to the Bolero. 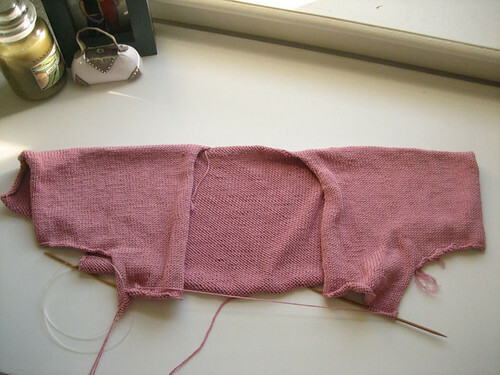 I don’t have size 3 needles to do the rib border, hense the start of Rusted Root. 9. I haven’t tried Fair Isle yet and find it intimidating even though many people have said it’s Not That Bad. 10. I feel a bit "less of a knitter" for the fact that I knit throwing the yarn and I go back and forth about switching this to "scooping" it with my left hand. I think I make pretty damn good stitches but feel that there’s this stigma that you’re a better knitter if you hold the yarn in the left hand. Like I’m a super beginner for knitting English and those who knit Continential are far superior. But I like the way I knit and the I like way my projects come out, so why should I change?